Measuring microscope 2034-CIL-300-ZX is the ideal aid for depth measurement. The virtually play-free, coaxial drive allows exact focusing on the focal plane. The microscope body of the 2034 series was modified to achieve this. With the standard 30x objective lens, a magnification factor of 300x, it achieves the low depth of field required for exact work. Naturally normal width measurements can also be made with the microscope which has 1 µm graduations on the scale integrated into the ocular. The measuring length of the scale is 0.2 millimetres and the field of vision is 0.48 millimetres. Important for optimism readings: Always focus the top and bottom focus level from the same side. This is the only way to ensure eliminate inaccuracies in the measurement resulting from a slight backlash. Here the coaxial illumination directly through the lens plays a significant role. This light guidance is the only feature that allows recognition of the focal planes. The fine focusing mechanism can be pushed to the side for quick adjustment. The MST stand provides a secure position on drums or flat material for depth measurement. An additional five millimetre X-adjustment at high magnification allows feed motion between the focal planes, when they can no longer be covered by the field of vision. The system allows a USB 2.0 camera with 1600 x 1200 Pixels and software for PC to be retrofitted. See Cellcheck CIL-ZX-USB for further information. The function of the 2034-300-CIL-ZX depth measurement microscope is described in detail in the operating instructions available for downloading. An additional stand with 25 x 25 mm cross table and optional rotating table is available to allow use of the 2034-CIL-300-ZX as a laboratory system. This stand is very useful when performing depth measurements on small parts. In such applications the parts can be positioned precisely with the cross table. Further optional accessories include the two V-blocks, which can be inserted into the rotating table using a fitted pin in the bottom. This allows applications such as quickly and reliably measuring the depth of scratches on round parts without investing a great deal of time. 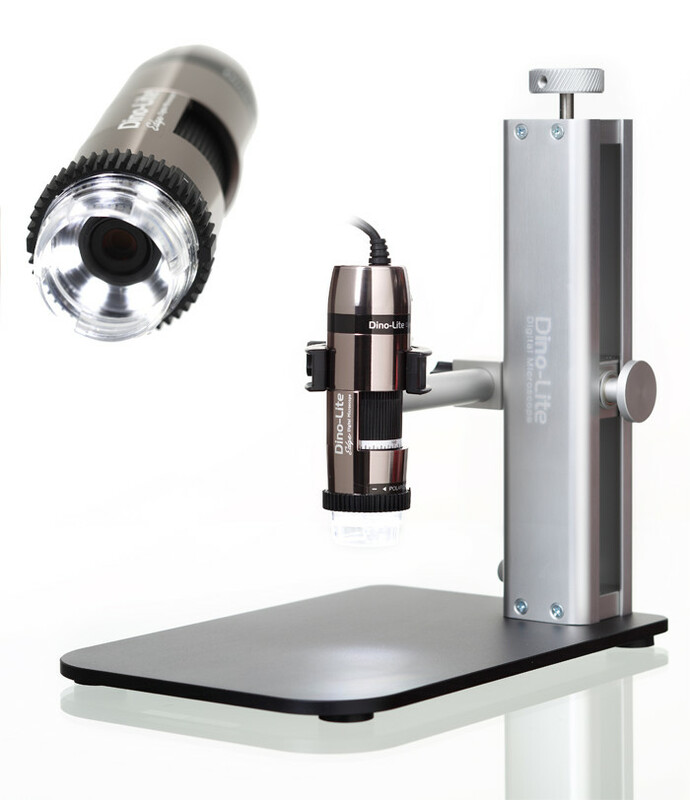 This microscope is also suitable for use as a mobile laboratory for measuring objects such as micrographic sections or other parts using the interchangeable objective and ocular lenses available as options. The 2034-CIL-300-ZX is shipped in an extremely sturdy plastic transport box. When ordered with the ST-CIL stand, the set is shipped in a special aluminium transport case.